This "Hot Spot" called Elkmont is a small Smoky Mountain community that started as a logging settlement back in 1908, then later a lavish vacation getaway for the rich. Much of its history still remains today. Folks come because it’s an interesting place to visit! 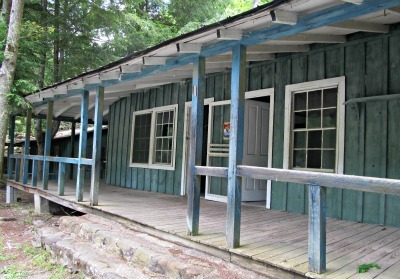 It has a log home community that was purchased by the wealthy and used for vacation homes. The rich have loved it here! So much so, they wanted to stay. 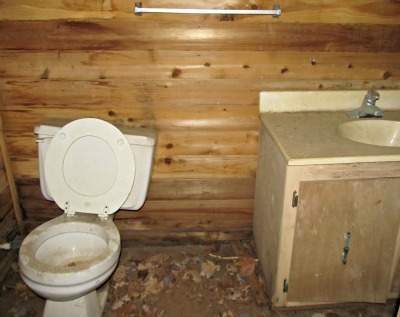 Some of these cabins have several rooms and indoor plumbing! Nobody has lived here for years. However, tourists drive by on a regular basis to see these old historical cottages. 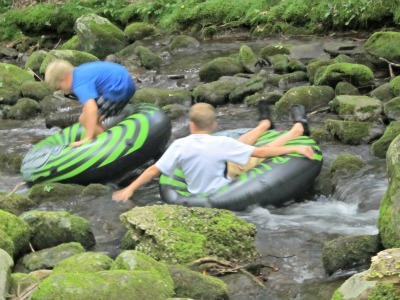 The landscape is equipped with a beautiful natural stream just perfect for tubing. The water is just many of the wonderful ways you can relax here! Cool off on a hot summer's day, or just let this cool mountain stream rush over your bare feet. You might try a balancing act by walking on the rocks! However, I must warn you, these rocks are slippery when wet! 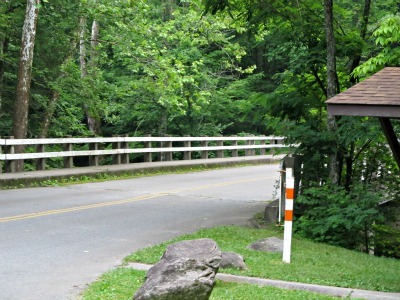 This community is home to one of the largest campgrounds in the Smokies. Sitting at an elevation of 2,150 feet, it's surrounded by everything the Great Smoky Mountains has to offer. You may choose to camp waterfront along the Little River, or just kick back in your tent, or RV on one of their other sites! Some offer hook-ups, electricity, and flush toilets. It sure is peaceful here! You feel as though you're miles up in the mountains, but the truth is you’re only nine miles away from Gatlinburg! When you’re ready to “get away,” Be sure you look up Elkmont! 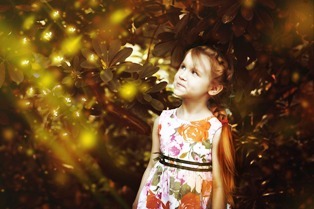 This hot spot is also an awesome mountain “hideaway!” A wonderful place to find tranquility! That is until you’re ready to come to life with all the fun, and excitement you can handle “just a stone’s throw away” in Sevierville, Pigeon Forge, and Gatlinburg! When you're ready to hide away someplace, this area is the perfect setting to get away from it all! 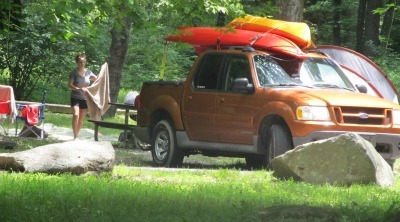 You'll love visiting Elkmont - the "hot-spot in the Smokies! The route begins at an Interchange with I-40 concurrent with US 321 ) and SR 95 south of Oak Ridge and north Lenoir City. The three highways head south to an intersection with US- 70 and I-75 in Lenoir City. They then continue southeast to intersect US 11 in Lenoir City. SR 95 leaves US 321 and SR 73 south of Lenoir City, The two highways head east into Blount County traveling just south of Friendsville. On the edge of Maryville the highways have a short concurrency with SR 335 and intersect US 129, in downtown they intersect US 411 and SR33. The highways then proceed out of Maryville and intersect Foothills Parkway's western segment in Chilhowee, turn south and then back east to Townsend where the highways intersect SR 73 Scenic. US 321 and mainline SR 73 turn north and SR 73 Scenic heads east into the Great Smoky Mountains National Park. The highways then continue northeasterly through Wears Valley to Pigeon Forge where they turn south onto US 441 and travel concurrent for 8.5 miles (13.7 km) to Gatlinburg (just before Gatlinburg, they have an interchange with Gatlinburg Bypass, where SR 73 and US 321 turn east and US 441 heads south. They then absorb and begin a concurrency with SR 32 in Cosby and intersect Foothills Parkway's eastern segment. SR 73 then leaves US 321 and SR 32 south of Newport. It then has a second interchange with I-40 and heads northerly to terminate at US 25 and US 70 on the east side of Newport.